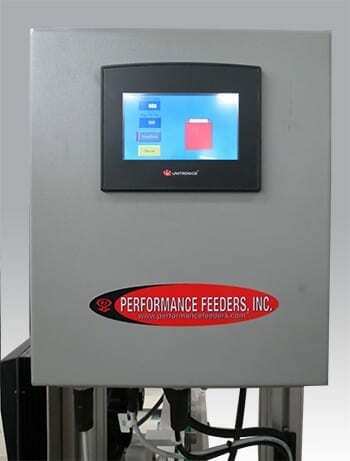 Our diverse product line allows us to design and build "integrated feed systems", where components from our vibratory feeder bowl, conveyor belt, centrifugal feeder and other specialty products are combined to create unique parts handling systems that combines the best characteristics of our individual products to meet the specialized requirements of modern automation systems. 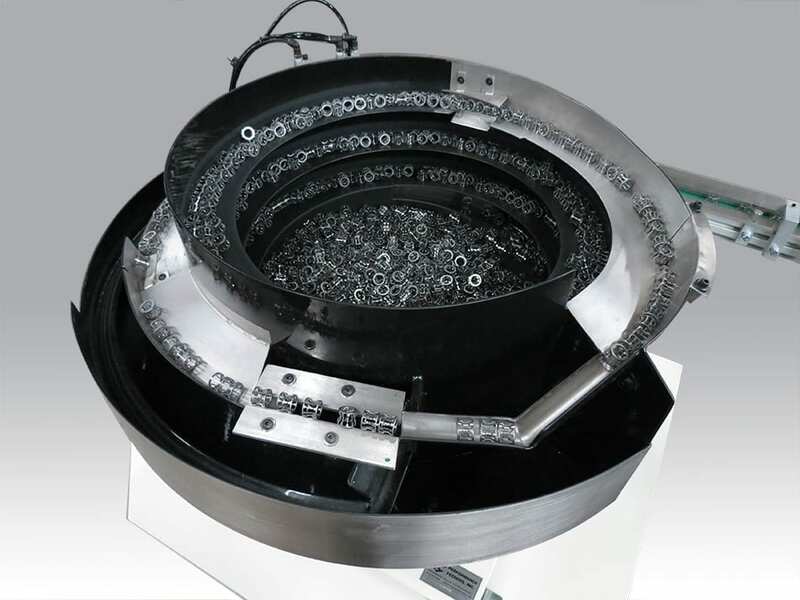 This custom feed system featured a vibratory bowl, designed to orient various sizes of bearing cages while also sorting and rejecting mixed product, and a count and batch conveyor which counted a pre-set number of selected product into the customer’s bulk packaging. 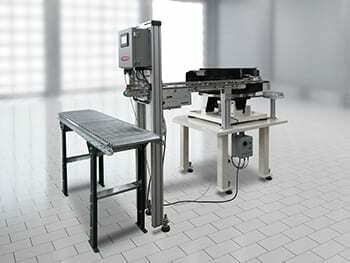 The system required a vibratory feeder bowl with tooling designed for multiple products, a custom conveyor tooled to count product at its exit, a roller conveyor to stage the customer’s packaging, and programmable counting electronics to allow the customer to pre-set a package quantity which varied from product to product. 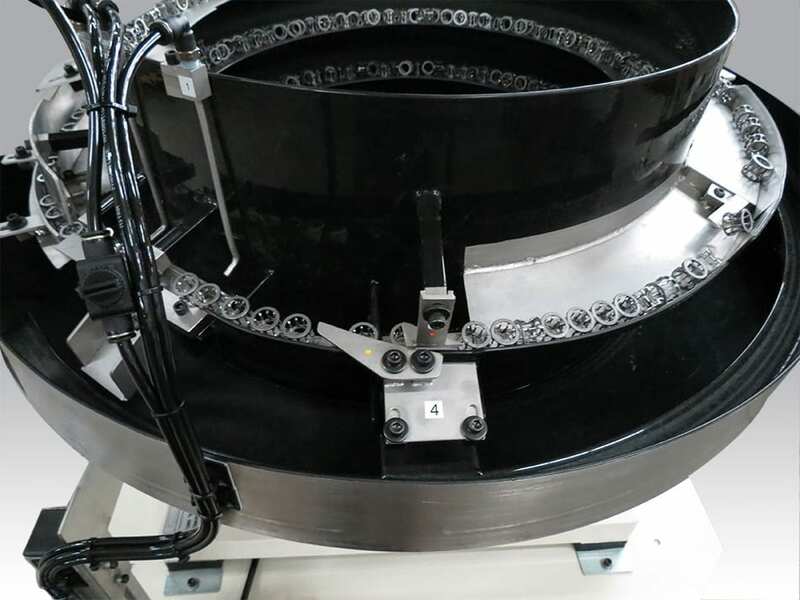 The vibratory feeder needed to be designed not only to accommodate a variety of cages but needed to be able to sort out and reject cages which may have inadvertently been introduced to the lot. 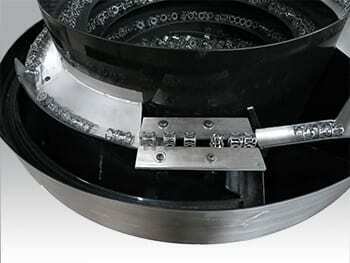 The bowl was lined with black Polyarmor coating to protect the integrity of the parts and reduce noise. Adjustable parallel blades allowed the user to set the selector with a gauge block provided for each individual part. Undesired parts discharge between selector blades into a reject bin. Position selector tooling blades were adjustable to dispatch parts not positioned in the required upright orientation for final selection. During the final selection stage, product which was out of tolerance for the specific lot were rejected and discharged outside of the feed system into a catch bin. 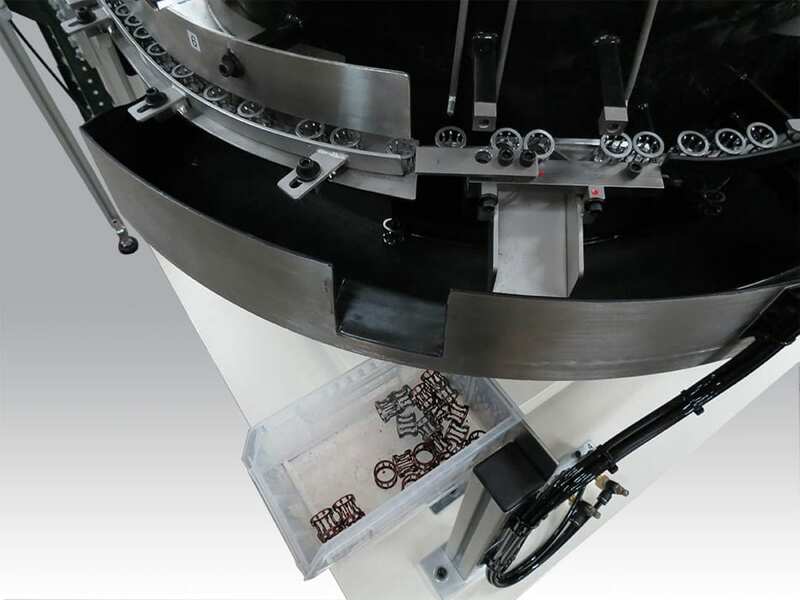 Qualified product passes from the vibratory feeder and onto a custom conveyor which carries the product into the count area. Photoelectric sensors on the belted conveyor monitored the part level in the track, signaling the bowl to turn off preventing part back-up in the system. In the count area, the product passes a sensor which detects the part and sends a signal to the custom controller indicating that a part has passed. 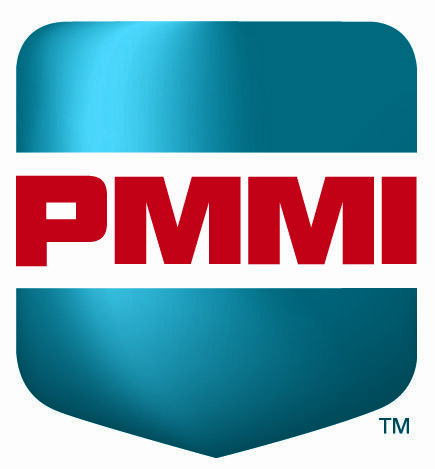 The custom controller utilized an HMI and various electronic counters to track the number of parts which moved into the customer’s packaging. The custom controller is programmed to allow the customer to input any desired number of product required for packaging, locally on the touchscreen controller. When the required count is satisfied, the system stops running. The operator resets to begin another cycle. A short roller conveyor stages the customer’s packaging and allows an operator to quickly replace the full package with an empty one and restart the system for the next run. This short video demonstrates the product moving through the vibratory feeder bowl, which sorts and orients parts, rejecting any which are out-of-tolerance. Parts transfer to a custom conveyor belt for counting by a photoelectric sensor and then to the collection area, which features a roller conveyor to stage the customer’s packaging. Feed Rate per Track: 90+ parts per minute. Input voltage: 120V / 60 Hz. 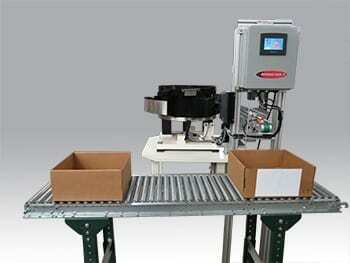 Counts parts as they discharge from the conveyor into customer supplied container. Operator pushes start button to begin counting process which enables the system to run until the pre-set count achieved. 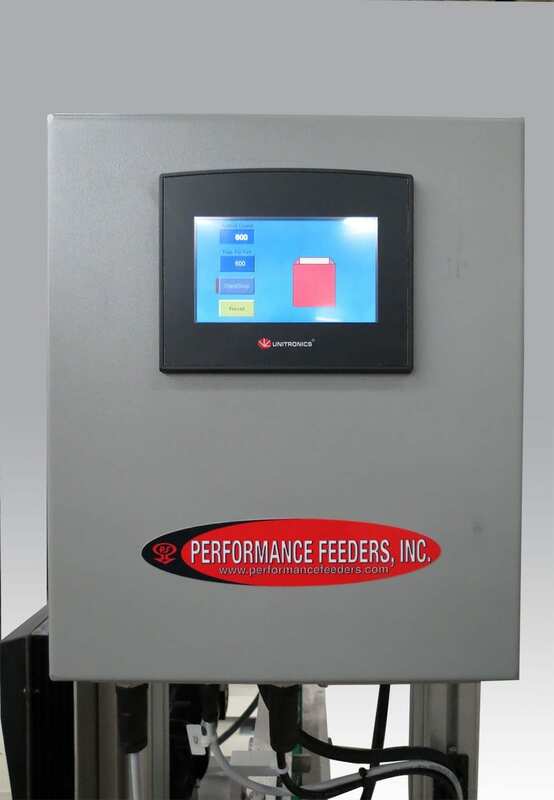 At this point the feed system shuts off until the operator resets and restarts the process. 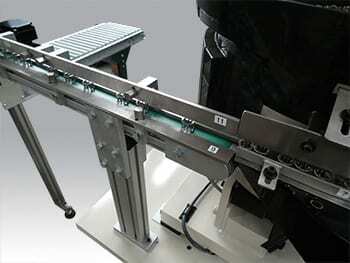 Photoelectric sensor on belted conveyor track monitoring part level in track. When track is full the bowl is turned off to prevent parts from backing up into the bowl. 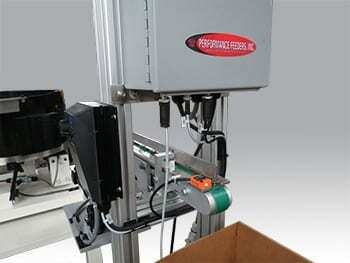 Proximity sensor on belted conveyor wired to a counter-box, counting a set number of product into the container provided by customer.